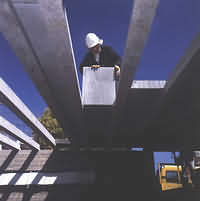 Beam and block floors were developed for use on sites with poor or contaminated land, or for sloping sites. Building above the ground overcomes these problems, as well as eliminating the risk of slab failure through clay heave or settlement of fill, problems mostly associated with a poured concrete floor. Today most new houses use beam and block floors and many of these incorporate aircrete as part of the floor construction. Specially profiled precast concrete beams reinforced with steel and typically 175mm deep are laid at specified intervals (typically 520mm) and the blocks are fitted into the gaps between them. To prevent movement once fitted, a grout is brushed into the joints between the beam and block. The floor is then finished with either a sand/cement screed, floor boards on battens or tongue-and-groove chipboard, with or without additional insulation. The overall dimensions of the Floor block are 440 x 560mm by 100mm thick. They can be laid in either the 440 or the 560 dimension which makes them an ideal infill for beam and block flooring systems. The laying rate is almost twice as fast as that for dense blocks. Normal 100mm Standard blocks can also be used within a beam and block floor system and can also be laid in either the 440 or 215mm direction. National Building Regulations are demanding ever higher levels of thermal efficiency, and ground floors have to be considered as part of the overall envelope. The Elemental Method requires the designer to achieve a floor U-value of 0.25W/m²K. Systems incorporating Celcon blocks can make a considerable contribution towards achieving the latest energy requirements by reducing heat loss through the floor; in addition, thermal bridging at the junction of the floor and wall is minimised. Compared to timber, beam and block flooring significantly reduces sound transmission between floors. It also eliminates the current day problems of “squeak and creaking” associated with many timber floors. The main advantage is improved sound insulation between floors. A beam and block floor will cut down the noise transmission of stereos, TV’s and computer games from children’s bedrooms, for example. This can be further enhanced because of the ability to build aircrete partitions off the floor, thus improving sound insulation between first floor rooms as well.